The term preventive maintenance refers to the practice of regularly servicing equipment on a pre-determined schedule so that your machine does not develop catastrophic failures and performs better over its useful lifetime. Although it is well known that equipment routinely serviced on a pre-determined schedule outlasts equipment that is not, many companies still indulge in the practice of neglecting 3D printing equipment and/or only responding reactively to equipment failures. Preventive maintenance has a number of powerful advantages that make it worth utilising. Because of these advantages, more and more companies are starting to realize the importance of taking proper care of their professional 3D printing equipment. 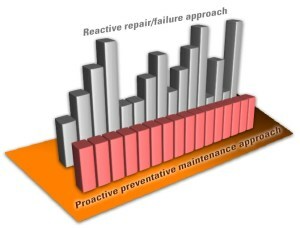 Contact evok3d today for preventative maintenance or corrective service.